What is it about goon squads that make them so identifiable in any language? Is it their simian brow, the Rotweiler stance, or their steroidal physique? Anyone who’s ever worked with men like this can tell you their cowardice is in reverse ratio to the size of the weapons they carry. 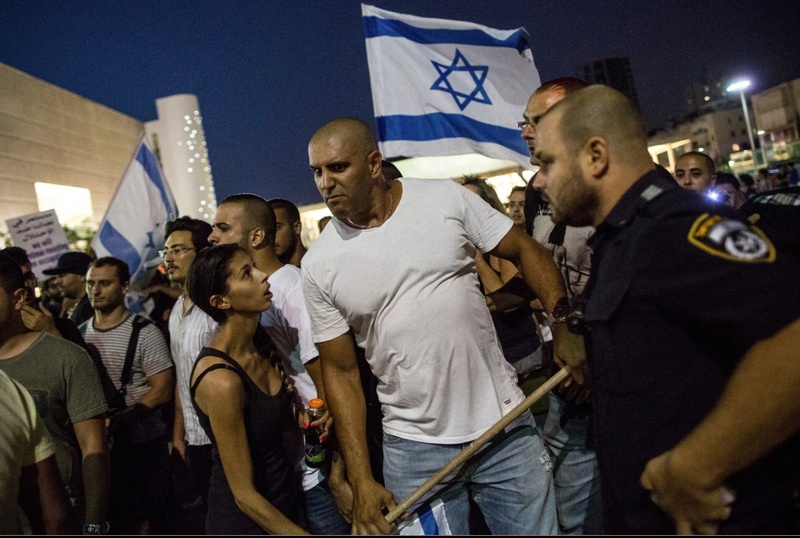 This bozo is one of several dozen in a right-wing goon squad that attacked several hundred Gaza solidarity activists with clubs last night in Tel Aviv. Protesters were chased with clubs, threatened with violence, & one man was beaten so badly he had to be rushed to the hospital in an ambulance. Witnesses say police did nothing to stop the violence or arrest the offenders. Netan-psycho-yahu & other Israeli politicians have whipped up a frenzied political environment that is unleashing the very worst elements in Zionist society–not unlike Nazism & the Third Reich. Israel may not have such an easy time controlling these anti-social elements once they’re unleashed. That’s their problem but points to the crevices in Zionist society. It takes extreme courage & commitment to protest Israel’s genocide in Gaza when you have goons like this coming at you. Our deepest respect & solidarity with the Israeli activists.